A Marine Corps Lieutenant General who earned his first Distinguished Service Medal for heroic work as Marine Corps aviator in France in 1918, died November 11, 1973. He was awarded a Gold Star in lieu of a second Distinguished Service Medal for skillful leadership and outstanding initiative as Commander of Allied Air Forces during a crucial period of Solomon Islands campaign in World War II. He also earned the Army Distinguished Service Medal as Commanding General, Tactical Air Force, 10th Army, made up of Army, Navy and Marine Corps units in the World War II Okinawa campaign. He was born on March 9, 1894 at Rochester, New York and was a 1914 graduate of the University of Notre Dame. He was appointed a Second Lieutenant in the US Marine Corps in June 1917. He began flying training in October of that same year and flew with the Marine Corps continuously until the time of his retirement, April 1, 1946. His promotions included: First Lieutenant, Major, 1934; Lieutenant Colonel, 1936; Colonel, 1941; Brigadier General, 1942; Major General, 1944. He was advanced to Lieutenant General on the retired list, having been specially commended for heroism in actual combat. As a member of First USMC Aviation Force, he was transferred to France in July 1918, where his unit became part of Northern Bombing Group, operating from airfields in Belgium and between Calais and Dunkerque. In October of that year he was awarded his first Navy Distinguished Service Medal. During the period between WWI and WWII he served with Marine Aviation on many expeditionary missions, which included service in Haiti, Santo Domingo, Nicaragua, Puerto Rico and Virgin Islands. During the second Nicaraguan Campaign, he was in command of Marine Air Units from July 1931 until the departure of all Marines on January 1, 1933. 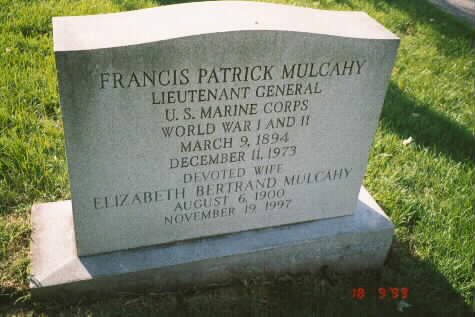 During interim periods of duty in the US, he attended the Air Corps Tactical School, Command and General Staff School, Fort Leavenworth, Kansas, and the Naval War College at Newport, Rhode Island. When the Japanese attack on Pearl Harbor plunged the US into war, he was serving as an observer with the British Western Desert Air Force in North Africa. He continued in that capacity until January 1942, at which time he was recalled to US to become Chief of Staff of the Second Marine Aircraft Wing. In August he became Commanding General of that wing. Under his command, the Second Wing moved overseas during December 1942 and January 1943. Establishing his Headquarters on Guadalcanal, he remained there from December 1942 to February of the following year as Commander of all Allied Air Forces based on the island, and earned his second Navy Distinguished Service Medal in this capacity. From the latter date until April 1943, he was Chief of Staff to the Commander, Air Forces, Solomon Islands, and from June to September, Commander of the New Georgia Air Force, and in this latter capacity earned the Legion of Merit. Upon completion of his first tour of duty in the South Pacific in early 1944, he returned to the US briefly and served as Commanding General, USMC Fleet Air, West Coast, from May until September 1944. Returning overseas, he was assigned as Commanding General of Aircraft, Fleet Marine Force, Pacific. As preparations for Okinawa campaign began, he was assigned as Commanding General, Tactical Air Force (TAF), 10th Army, and Commanding General, Second Marine Aircraft Wing, with the Second Wing's tactical units augmented by Army and Navy personnel, forming the nucleus of TAF. For his service prior to and throughout the Okinawa campaign, was awarded the Army Distinguished Service Medal. In June 1945, he returned to the US and following hospitalization at the Naval Hospital, San Diego, and was assigned to an inactive status on December 1 awaiting retirement. He retired with the rank of Lieutenant General, April 1, 1946. Medals: Navy Distinguished Service Medal, with Gold Star in lieu of a second award (France, 1918, Solomon Islands, 1942-43), Army Distinguished Service Medal (Ryukyus Campaign, November 1944-June 1945), Legion of Merit (South Pacific, June 30, 1943-August 8, 1943), Special Letter of Commendation from the Secretary of the Navy (Nicaragua, 1931), Army Letter of Commendation (Solomon Islands, July 25, 1943-September 24, 1943), USMC Expeditionary Medal (Haiti, 1921-24), 2nd Nicaraguan Campaign Medal (Nicaragua, 1927), American Defense Service Medal (1939-41), Asiatic-Pacific Campaign Medal (1942-43, 1944-45), European-African-Middle Eastern Area Campaign Medal (North Africa, 1941), Victory Medal, WWI, Victory Medal, WWII, Nicaraguan Medal of Distinction, Nicaraguan Cross of Valor, Commander of the Most Excellent Order of the British Empire. He is survived by his widow, Elizabeth, who resides at 500 J Avenue, Coronado, California 92118, and 2 children. Married: Elinor Wolf, July 23, 1919 (deceased March 26, 1922). Married a second time to Elizabeth Bertrand, November 14, 1934. 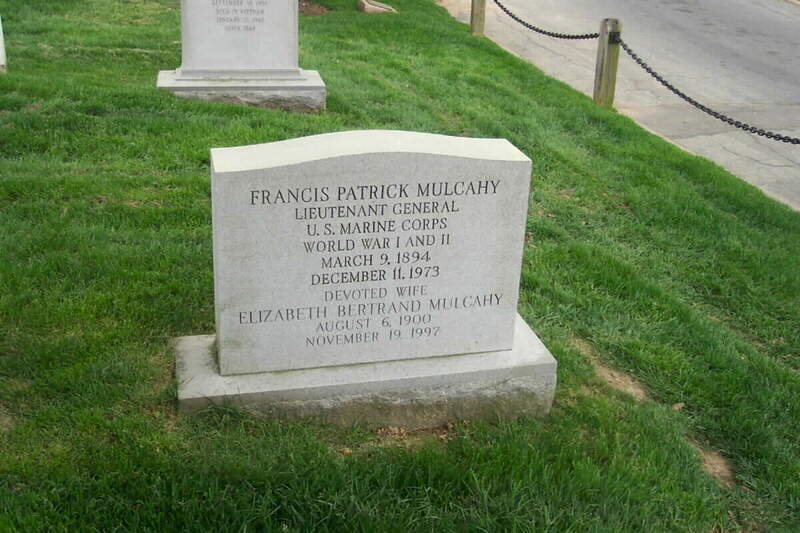 He is buried in Section 2 of Arlington National Cemetery.